Pastor Adeboye’s recent declaration that non tithers will not make heaven is still causing wahala on the internet. A Twitter user who is also a member of RCCG recently labelled the man of God a fraud. 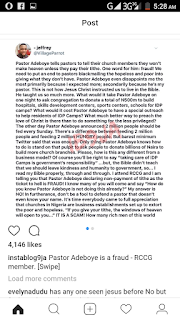 Humb's blog had earlier reported that popular preacher and General Overseer of the Redeemed Christian Church of God (RCCG) Pastor Enoch Adeboye had revealed that anyone who does not pay tithe will not make heaven. That video has elicited response from all over the country with many criticizing Pastor Adeboye for his declaration while others are in support of him. 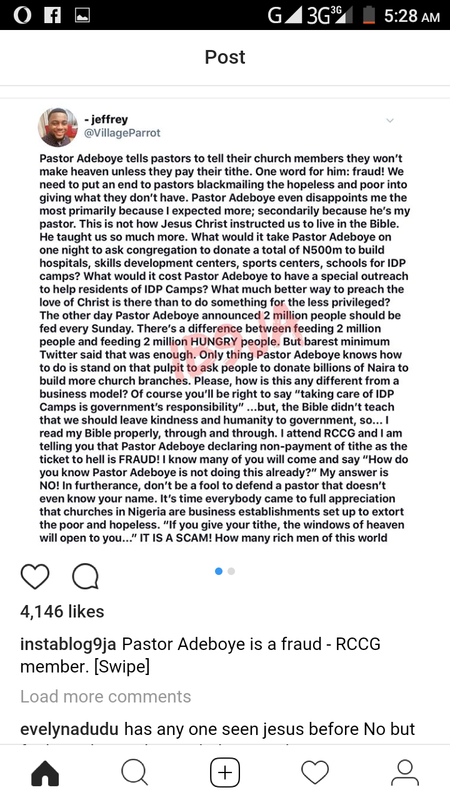 One member of the RCCG took to his Twitter page to label Pastor Adeboye a fraud because of his statement. He also said controversial Shaman Guru Maharaji will make heaven before him and other pastors who preach the tithing gospel. “Pastor Adeboye tells pastors to tell their church members they won’t make heaven unless they pay their tithe. One word for him: fraud! 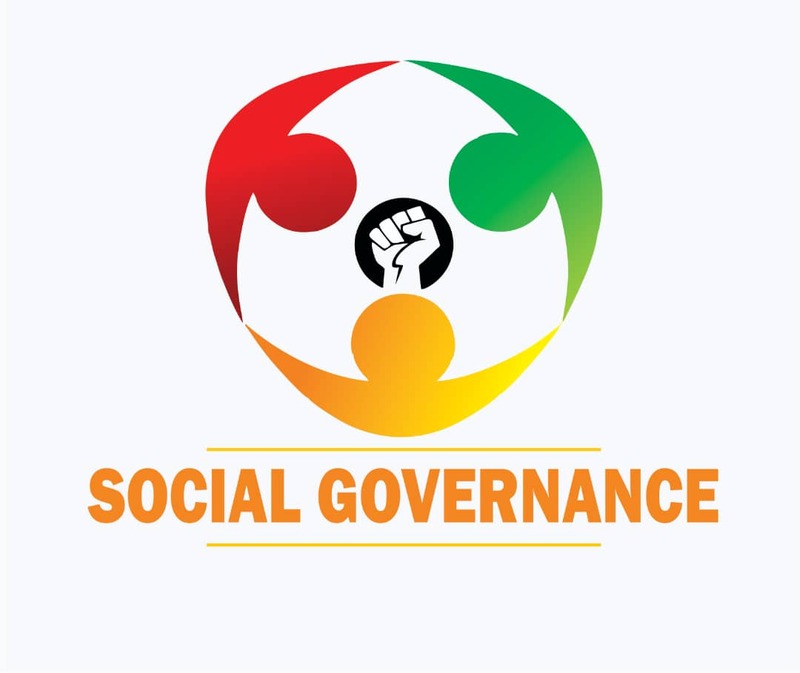 We need to put an end to pastors blackmailing the hopeless and poor into giving what they don’t have. Pastor Adeboye even disappoints me the most primarily because I expected more; secondarily because he’s my pastor. This is not how Jesus Christ instructed us to live in the Bible. He taught us so much more. What would it take Pastor Adeboye on one night to ask congregation to donate a total of N500m to build hospitals, skills development centers, sports centers, schools for IDP camps? What would it cost Pastor Adeboye to have a special outreach to help residents of IDP Camps? What much better way to preach the love of Christ is there than to do something for the less privileged? ThanksThe other day Pastor Adeboye announced 2 million people should be fed every Sunday. There’s a difference between feeding 2 million people and feeding 2 million HUNGRY people. But barest minimum Twitter said that was enough. Only thing Pastor Adeboye knows how to do is stand on that pulpit to ask people to donate billions of Naira to build more church branches. Please, how is this any different from a business model? Of course you’ll be right to say “taking care of IDP Camps is government’s responsibility” but, the Bible didn’t teach that we should leave kindness and humanity to government, so. I read my Bible properly, through and through. I attend RCCG and I am telling you that Pastor Adeboye declaring non-payment of tithe as the ticket to hell is FRAUD! - Ask for donation -I know many of you will come and say “How do you know Pastor Adeboye is not doing this already?” My answer is NO! In furtherance, don’t be a fool to defend a pastor that doesn’t even know your name. It’s time everybody came to full appreciation that churches in Nigeria are business establishments set up to extort the poor and hopeless. If you give your tithe, the windows of heaven will open to you...” IT IS A SCAM! How many rich men of this world give tithes? Dangote dey pay tithes? Okay, I know you’ll say devil gave them that money. Shut up! Money, money, money, money. Guru Maharaji will make heaven ahead of some of your “anointed” pastors. It’ll shock you. All the tithe RCCG has been receiving, what have they done with it? They successfully built a school that members of their church can’t afford. School built with their hard-earned money."